Fog and the suspension of space: In the context of STWST48x2 the Fog Ballet was presented as an installation with 2D-glasses. Tanja Brandmayr about her project, a quasi-hologram, human intentions, a reversed notion about ballet and the dialectic turn. In the room there was a fog machine that was permanently blowing out fog. There also was a projector who projected an image at the dense layers of fog: the image of an alternately static as well as moving body. 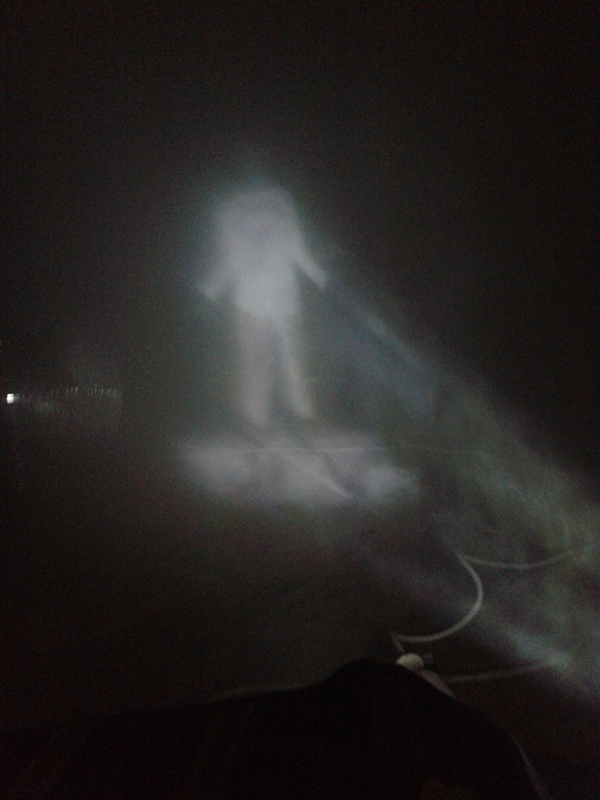 Within such a situation of actors mutually in motion – the image of a human body in motion and the medium of fog that permanently changed shape and contour – effects of spatial perception were simulated. In the mutual contrast of relatively base artistic means and a sophisticated setting a quasi-hologram of a human figure established itself within a magical interplay of light and fog out of the dark. With a figure in double motion and remarkable effects of threedimensionality. 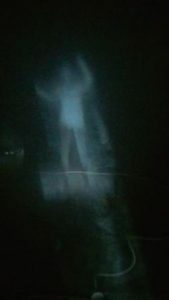 The „hologram“, on the other hand, was solely visible from a single perspective – posing the question of what we could be actually able to see in our realities, especially if these realities become nebulous. In the particular situation of the room for which the artistic project was specifically designed this foggy situation was on the one hand perceivable via a great glass window that shut off the room internally while from from another perspective, from coming from outside, the spectator sensed the entire building as „burning“: clouds of smoke passed out of the window – and had to pass out, to keep the situation in the inside stable. At one side, shut off through the glass window and seen from an interface as a „reduction“ of space (as the fog overwhelms space), the room was pulsating wildly – as a reference to fire, disaster or the machine age. Respectively, as we could ask ourselves, what we can actually see and recognise within our smooth realities, and while we were able to perceive via the glass door the delicate balance, that while somebody enters the room a small cloud of smoke gets out i.e. a somehow subtle exchange takes place, we have to realise that on the other side the realities in which we live in are nevertheless constructed with the help of machines and within a thoroughly brutal economic chain of production and distribution. Fog as an actor inside the room: At first clouds of smoke present themselves as threedimensional structures, transforming in aleatoric fashion. The swathes disguise, hide, make invisible. Over and over the fog fills out the room and becomes an equally distributed mass. It dissolves space by universally connecting it internally and making it invisible. Such are the maneuvers of the actor „fog“, as long as there is no intrusion. Yet within the Fog Ballet the fog was not left unpersuaded, instead such a situation of levelling was to be avoided, giving the fog the chance to become the medium of the projection. Through the swirling of a ball and the circulation of air a carefully balanced situation was established which made the projection possible in the first place: It was only in this stabilised disequilibrium, that worked against an entropic levelling and a levelling of space and material, that a human body could become visible and, as a co-actor, could confirm his status as an actor in the corps de ballett. 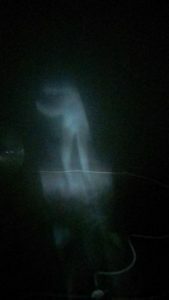 The body became visible in a loop of abrupt movements (indicating a circulation) on the one hand, and a standstill that became the surface for the projection of the fog´s movements on the other hand. Within this projection contradictory movements of the actors fog and light came into being. In „magic disguise“ the scenario can be interpreted as a somehow dramatic assertion of the classic human actor – within a projection surface that diffusely connects and dissolves, and that is, due to its own flexibility, not able to establish proper surfaces. The phrase of the „assertion oft he human actor“ is not only adressed in its fictionality, but as a true assertion of the human figure per se – in its refusal and rejection to disappear. Of course the magic of the tightrope walk of this both diffuse and voluminous and threedimensional figure, the magic of the projection of the figure into such a medium marks the interesting point – eventually also as a reference to an individual unwilling, or not able to disappear. Yet what lies beyond, and beneath? We have fog as a material, fog constructed by a machine which can be (mis)interpreted as a steam machine all alike, especially when viewed from outside. On the other hand the fog inside the room marks the contradictions of its own existence as the actor as which it was established and on the other hand as a medium that both connects space as well as it dissolves space. It comes to mind that this statement of connection and dissolution also adresses the idea of the network – as such it would collide in itself as both actor and network – and in this respect the fog establishes communication with all the actors in the fog-ballet: Space/room inside and outside, with air draft, temperature and weather conditions, respectively inside light, projection and audience. At any rate: Someting has happened (within the scenario), while nothing impends to happen (within this equalisation and levelling). 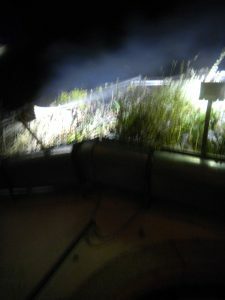 The fog connects things in a diffuse way, while the only interesting focus lies where the projection takes place. Where the view focuses on the swaths and turbulences that emanate in the light and on the other hand the human figure is apparently suspended between vanishing and emanation – it is only there that the things happen that matter. And in this gaze, in this existentially fragile balance of to be or not to be lies the tranquility, the fragile truth about our system that stands at the edge of the abyss while at the same time truths blow wildly. And the human, into whose ears these truths are blown, shakes the head like a cat with which we try to communicate. Unfortunately nothing is audible at that moment. An element of the installation also was a pair of 2D-glasses, which, as a simple no-tech element only left one eye open. This – either good or bad – joke of a voluntary reduction to a single seeing eye, this proposed abandonment of two images which neurologically make threedimensional spatial perception a possibility in the first place, was a reference to the interplay of space and image, i.e. between 3D and „2D“. In a certain sense the Fog Ballet was also a quasi-enactment of space, dimensionality, reduction, suspension, extension, interior (space), irrationality and critique. Simultaneously with a hype about 3D-technology „in reality“ this low-tech 2D-glasses are a conscious reduction, that on the one hand refers to technology that already exists and which on the other hand introduce a network interface. Without a specific comment. Through inversion, reduction and extension contradictions between abstractions and the human dimension are mutually mirrored. The 2D-glasses are but a deadpan joke and a timeless statement about the „flattening“ of the world. We have a thematisation of dimension – between barbarian indifference i.e. a hyperacceleration of technology and a rationalisation of all aspects of life that happens simultaneously, and then, again, the assertion of a human interior behind the seeing eye. The 2D-glasses enacts a game with paradoxical creation of threedimensional projection. A voluntary reduction. Behind and beyond that there are, again, other things that matter and that are present in their invisibility all alike. How should fog ever learn to dance? Again, a joke in the script, since it is obvious that it does. The ballet as a concept is a dummy that, in contrast to the usual transmission of meaning in ballet, keeps something free. 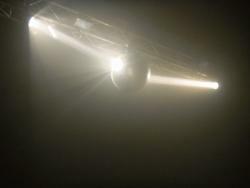 As indicated above: The ballet consists of actors in motion and exchange: interior (space), outdoor space, fog, light, projection, perspective, audience, as well as objects like the fog machine, a ventilator, etc. In any case: a loosened notion of ballet. Ballet indicates and interplay of several components and other actors that often lose themselves in the background yet eventually indicate human nature and the (resistant) individual. That is, obviously, the „theater of meaning“ (Bedeutungstheater) that is proclaimed at the Fog Ballet – and signifies also the dialectic turn that has to adress the universal, interrelated contradictions in a new way by opening the path to a new materialism that resonates to the situation of contemporary man. Even in the most romantic tradition ballet amalgamated the most obvious opposites of extreme discipline and extreme emotionality. Choreography is all about space and time, pure geometry and form. 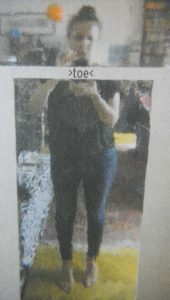 The basic geometry was the vertical axis of the body and the vertical posture. The head, as the mind, was above the body. At best, the body was twisted and inclined. The lunatic experiment to walk in toe shoes even further can also be interpreted as a counter movement to an emotional interior. Yet these contradictory movements are of interest, in my opinion. In so far as it takes the concept of ballet as a structural blank space for a different fashion of interplay and then reorganises the actors and the components – and, as a consequence, establishes a different narration with a different dramaturgy. In a certain way the Fog Ballet is also a symbol for a different form of actor, or of organisation, i.e. the organisation of an actor who got rid of a solid body. Who affirms the contrasts in which an actor is situated, where the actor simultaneously is the medium. That is one thing. It installs this contrasts into space: spatiality, flattening, the suspension of space, the identification of actor and medium, and smoke and fog also as a phenomenon of nature and industry, the era of the stream engine and morning fog, the beginning of the industrial age and the timelessness of nature. That means, then, the magic as well as the contemporary drama: Especially the most contemporary identification of actor and medium, i.e. a levelling via entropy as equalisation rendering everything dysfunctional, including the projection, and a magic that happens under certain circumstances nevertheless. Yet such a thing needs meticulous premises, and knowledge about the substance that gets influenced so heavily yet behaves erratically all alike. A different drama arose only as an additional image and refers to the vertical axis of head and body in traditional ballet. In between the vertical axis of „head“ and „body“ a „ToE“ installs itself. As a longing within universal rationalisation a „theory of everything“ has found an irrational center. Further theaters of meaning of heavily divergent opposites and contrasts – and their freshly to be established connections within different settings again. With this theme of »loose reference to the existing term of quasi objects« the last element of that theater of meaning shall be adressed as, on the one hand, the image of the ball – as well there is, on the other hand, a „loose reference“ to an object that normally is located in the Stadtwerkstatt, in just that specific position as is indicated in the image. That ball was removed and later became the respective element at which the fog became swirled, in order to form the cloud that could function as a projection surface. In addition to that, with this element not only the connective functionality of the ball within the game should have been enacted but also the dramatic element of wildly divergent opposites, drifting ever more apart – that is to say, an additional enactment of „world“ and „case“. During the preparations for the Fog Ballet some associations occured to Wittgenstein´s »Tractatus logico-philosophicus« by chance. We take this ball, in its natural habitat, and take it for the absolute realisation of the „world-case“. We take the famous first sentene of the „Tractatus“: „The world is everything that is the case.“ We create two seperate, obscure, satellites of meaning that project: „The world is everything that is decay“ and: „The world is everything that comes to mind (as an idea).“ It is as if these two statements, projected onto a rotating ball, developed into a feedback projection of negation and idiocy that nevertheless diffuse into space in constant rotation. This „world-case“ statement, confronted with terminal decay and the occasional momentum of sparking banality, simulates the circumstances in which we are embedded. Body and foundations fall apart and cannot connect anymore. Random thoughts constitute arbitrariness. It all constructs simultaneous, levelled surfaces, i.e. a pathology of logics, that creates real misery in the end. It seems that these conditions have already established themselves and created a diffuse atmosphere that blocks practical action. In this example of a new „world-case“ statement mindlessness seems to prevail. The new dialects of logic – an altar of rationalisation, and the swansong to it. Perpetuated by empty automatisms. The reference to Wittgenstein is of interest as the „Tractatus“ could be read, in a certain sense, that is at least the approach in this connection, as a programming language: You had logically constructed sentences and hierarchies. And there was this friendship between Wittgenstein and Bertrand Russell who wrote „Principia Mathematica“ and created a „logical atomism“ which was met with indifference at first. After a while people like Gödel or Turing came, but only few people understood what that actually way all about. And from that, and from such a handful of intellectuals, computers, personal computers and the internet came into being… And at the end you have this nothingness of „automatism – entropia“. In that way, the assertion of „the world is everything that is the case“ is displayed in fast motion in the Fog Ballet – taking the advent of logics to the swansong on logics, to decay and indifference. Since meanwhile philosophy and the logics of computers and the digitalisation of the world has turned into a sell off of space into a zero-dimensional interior. The control over the human interior. Insofar the world is not anymore „everything that is the case“. Another one of Wittgensteins famous statements „whereof one cannot speak, thereof one must be silent“ is an assertion that makes logics apparently totalitarian, but actually confirms that the things about which one must be silent are the only ones of true importance. Unfortuantely such a silence gets discredited as irrational and irrelevant too quick. Yet to be silent would be an important counterpoint to anything that cannot be captured with logics, i.e. irrationality, indetermination, magic, miracles, mysticism, art, poetry, music, dreams, and pain. As art naturally knows. Or the new quasi-art ToE betweenand. What can be said is that the pursuit of such hermeneutic things like art stands to an even more dramatic extent against other things. Since although art is about a thoroughly concise denotation of things, or of substances or of media that make up contemporary material, it has to be taken into consideration that plenty of people are thoroughly indifferent towards art! Especially today where, bizarrely, a person would rather buy a rifle to bring drama and adventure to his life or to make target practice to be adequately prepared for World War 3 this seems to be the case. Such are the real dramatic developments today, within say, conditions of post-factual obfuscation. The diffusely connected/connecting fog of volatile emotions and opinions that remain as nothing is able to form and to establish itself inside universal levelling. States that would like to properly organise themselves but come to nothing but distorted and unsuccessful projections. All that: bizarre and incredible. Indeed, a new dialectic turn would be needed, a new materialism. History, accumulation of knowledge, responsibility, fragmentation and deconstruction are things that we have nevertheless. Something needs to be set into motion. Although properly, at first, one should be silent about it. Ideally this would be the case in many situations of observation, or in the case of a text like this, which one would have liked to write alongside a nebulous journey, only to remain puzzled in the end – or one would have liked to read only to remain without an idea about what it said. As we have it, for instance, in a case like this.